Clare of Boulder Creek California. Speedometer: Custom Expedition speedometers were developed and fitted to both Land Rovers. They report speed in kmph and mph. The trip odometer is a must have item. 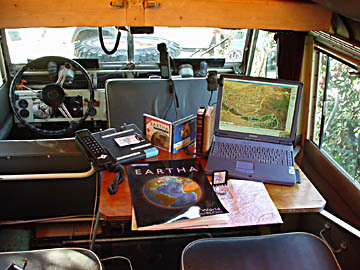 Volvo seats: Hercules is setup seats from an old Volvo to provide Cadillac comfort. The passenger seat swivels 180 degrees to face the rear. 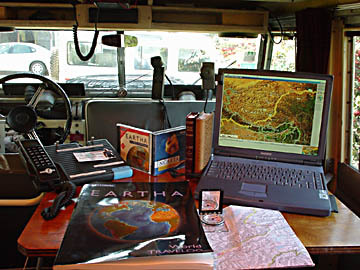 GPS Receiver: The Garmin 12XL Global Position System receiver guides the way but we often use this device's low tech predecessor, a compass. When we're through these devices should be full of interesting logs data. Power inverter: 300 watt power inverter converts DC 12 volt automotive power to AC 110 volts. Used to power electronics, including computers, GPS, and charging batteries. two burner camp stove. Located beside the stove is a sink with manual hand pump. Below the sink we store twelve gallons of water in heavy duty plastic containers. 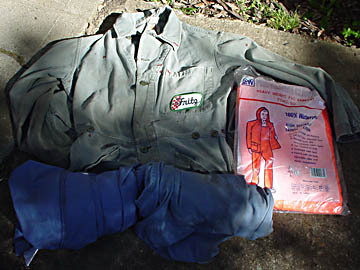 The expedition guide recommend at least two gallons of water per person per day. Propane tank: The stove operates on propane tank so Hercules is setup with a propane tank mounted in a custom location in the rear bed toolbox area. Thanks to Pat Young of RoverGo we have an threaded adapter so our tank can be filled in other parts of the world where a different connection is used. Cabinet: Pots pans, food, coffee, it's all up here. Enough food to last us three days in a pinch. should have been a factory option when these vehicles sold new. pump, jetted down for high altitude. We,ll swap in the new fuel system when we reach 10,000 feet. within arms reach of all passengers. 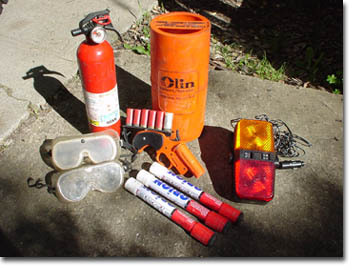 Flares, hazard lamps, and goggles complete the safety checklist. doesn't get his wish but if he does he will have (hopefully) everything he needs to complete the job. Our custom kit contains everything including bandages, antibiotics, medical tape, aspirin, and anti-malaria and diarrhea medicines. However, we left the adrenaline shot at home. place to setup base camp, have a meal, or play cards. voice, fax, and email capability. Calls can be made from this unit from just about anywhere in the world to anywhere in the world...and it's pretty affordable. 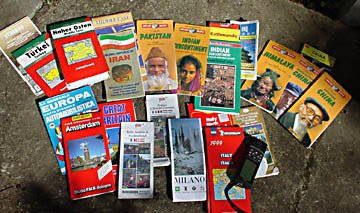 MVS/USA is a sponsor of our AroundTheWorld1999 Expedition. encyclopedia doesn't take up an entire bookshelf. 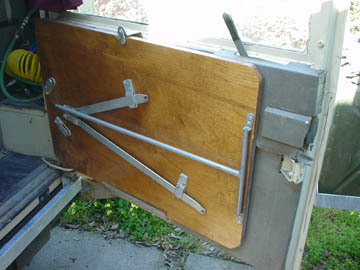 A six gallon air tank is mounted on the rear cargo cabinet floor and facilitates quick tire inflation. 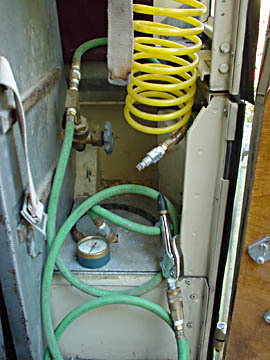 An additional connection on the tank can be used for air tools.